MAXIMA Dent Pulling System is a professional panel dents repair equipment designed to current automobile aftermarket. 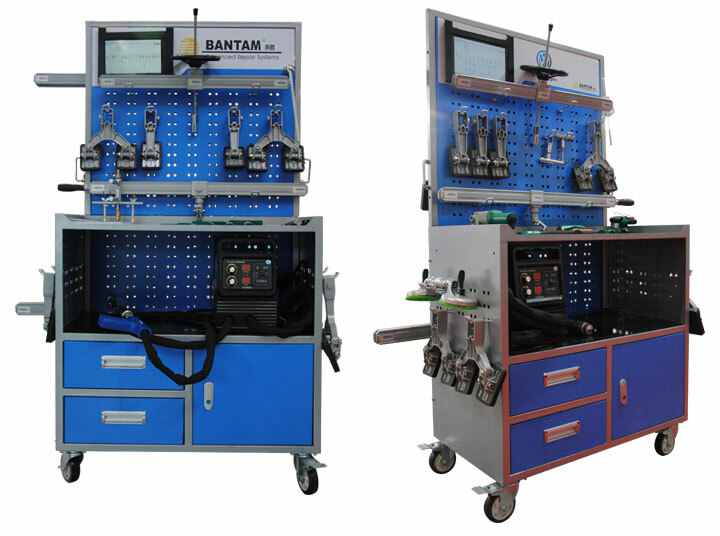 With its welding machine and professional set of the combined tools, it could weld several washers into the dents, and repair them with Dent Puller combinations. The operators could easily repair the dents. The users could reduce repair cost and improve efficiency. With MAXIMA Dent Puller System, the work speed could be improved by 3-4 times. The system will help repair workshops to realize high efficient repair turnover. In usual repair process, we need at least 2 hours to recover a very small dent on the vehicle body. With MAXIMA Dent PullIing System, it'll be shortened within half an hour. The system will recover the small dent by one time pull only. It reduces the distortions by times pull for this area to highlight the accuracy. Also it will not impact the original rigidity of the area, too. This system will reduce the polishing area by 80%, and the polishing times by 60%. It will not only save your electricity, sand paper, washers etc, but also the labor cost. The less welding and polishing dust will give technician better working area and lower labor intensity. This puller is designed for rigid parts of the vehicle body. Supporting by different points, the pulling rate can be adjusted. It has lock-up function to facilitate other operations. The strong pulling capacity almost meets all dent pulling requirements for auto body. This puller is easy to operate. Simply welding some washers on the deepest point of the vehicle line, and then using this system with supporting points and beams to repair the dent easily. Simplicity and large pulling capacities will ease your work and get accurate line repairs. Pulling and planishing at the same time to control the panels easily. It consists of supporting pad and beam, and can pull several panels on the vehicle body. Pulling out the dent easily and rapidly, meanwhile ensuring the pulling quality. This puller is as easy as your hand. It can pull the washers directly. With a hammer, the small dent can be rapidly repaired. When we repair the rigid parts of the vehicle such as door post, it will be very difficult to repair by our normal welding machine. If we repair these parts with MAG welding machine and pull by Auto Collision Repair Bench, the vehicle body may be damaged. 3.Pull it with MAXIMA Strong Puller. Our traditional method to repair the vehicle roof will be very time-consuming and inaccurate. The engaged strength and repair quality cannot be controlled. 3.Pull it with MAXIMA Lever Puller. Every vehicle has its own Belt Line which runs through the whole vehicile body. It's not easy to repair it by traditional repair method. With different combinations of MAXIMA Dent Pulling System, you will enjoy repairing all dents on the vehicle body. It will greatly ease the work intensity, improve the work efficiency, guarantee the maintenance quality and reduce the maintenance cost. Welcome you come to inquire this best Dent Pulling System from MAXIMA.